Smart two bedroom apartment located close to the centre of Edinburgh and also within walking distance of Murrayfield Stadium. Stunning views of Edinburgh Castle and city skyline. The accommodation consists of two bedrooms (one king-size double, one twin), spacious sitting room with balcony, dining hall, kitchen and newly fitted shower room. Fully equipped kitchen contains fridge/freezer, washing machine, dishwasher, cooker and microwave. 3DTV and Apple TV. The apartment is well located for shops, cafes, bars and restaurants but is also on a regular bus route with a ten minute journey to all city centre amenities. Free parking is available in the grounds of the apartment or in surrounding streets. Late arrivals can be accommodated. 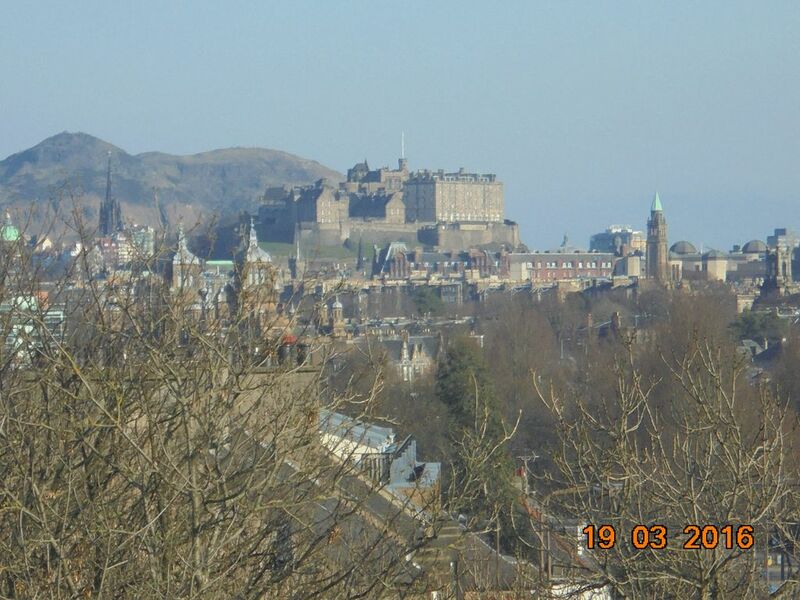 View of Edinburgh Castle from bedroom window, easy access to city centre, walking distance to Murrayfield Rugby Stadium,close to amenities. Lovely place to stay, great location to Edinburgh. Glad you enjoyed your trip and hope you managed to walk everywhere without google making you walk the long way. I must admit you see more when walking rather than using public transport. Thank for the great review and it makes it even better as it's your second stay. Your welcome any time. The apartment was perfect for our long weekend in Edinburgh. Everything was clean and comfortable and Magdalene even provided a few kids books and toys, along with the travel cot! It’s a quick bus ride to the center of town and there is available street parking, as well. Thank you for the review and I am glad you enjoyed your visit to Edinburgh. It is no problem to provide a few toys as I want all my guests to enjoy their stay. This place had everything we needed plus some, she was so orgnized and helpful, close couple min walk to busses and even if u enjoy a walk about 40min walk to city center and the castle. Very clean, very comfortable beds. I reccomend this to anyone going to edinburgh. Thank you Stefanie for the great review. It's good to hear that you walked into town as it is quite a pleasant walk with lots of different architecture types through the ages. I am so glad you enjoyed your stay and it is great to receive such a positive review. The apartment is well situated for a multi cultural visit to the beautiful and historic city of Edinburgh with many visitor attractions such as Edinburgh Castle, The Palace of Holyrood, The Royal Yacht Brittania as well as numerous art galleries and museums. In August the city is home to the Edinburgh Festival and Fringe when the city comes alive and the atmosphere just has to be experienced. If wanting to tour central Scotland, the apartment is ideally situated being within one hours drive of Stirling, Glasgow Perth and Dundee. A non refundable deposit of £100.00 will be payable on booking and the remaining balance will be due four weeks before arrival date.